Although the crowned eagle's long tail imparts an overall length up to 90 cm (35 in), it is somewhat less massive and has a considerably shorter wingspan than Africa's largest eagle, the martial eagle (Polemaetus bellicosus). It is nevertheless considered Africa's most powerful eagle when measured in terms of the weight of its prey items. It often preys on mammals such as bushbuck (Tragelaphus scriptus), exceptionally weighing up to 30 kg (66 lb) albeit usually much less. The crowned eagle possesses unusually large talons and strong hindlegs, and may kill by crushing the skull. The eagle is also ferocious; some records from beneath a nest show the remains of a large, male Sooty mangabey weighing 11 kg (24 lb). 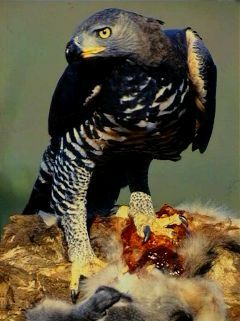 Due to their ecological similarities, the crowned eagle is Africa's best analogue of the harpy eagle (Harpia harpyja). Thanks to its bold and highly conspicuous behavior, it is exceptionally well-studied for a large, forest-dwelling eagle. Due to a relatively high level of habitat adaptability, it was until recently considered to be faring well by the standards of large, forest-dependent raptors. However, today it is generally thought that it is decreasing far more than was previously perceived due to the almost epidemic destruction of native tropical African forest. It is now listed as Near Threatened.